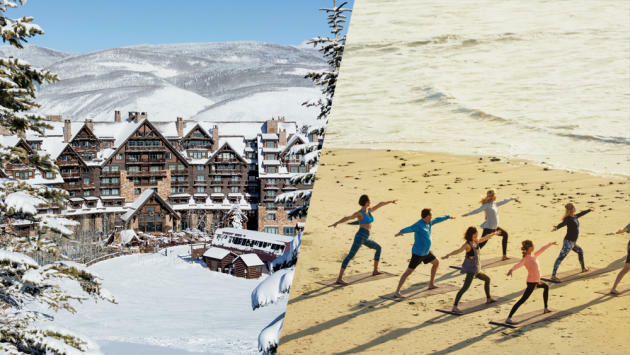 Booking an escape from awards season’s hum of activity comes down to preferences: whether to mindfully relax in seclusion, hit the slopes, or be at the center of the action in a rarefied urban palace. Here are some destinations to consider. Go for the convenient location (90 or so minutes north of Los Angeles), stay for the quiet, lush palm-dotted grounds and pro service at the Four Seasons Resort, the Biltmore in Santa Barbara. Celebrating 90 years in December, this 207-room grand dame shows no sign of her age: owner Ty Warner keeps the Spanish Revival building in peak form — from the gold-leaf stenciled ceilings in the lobby to the re-done residential style bungalows, several now with plunge pools, outdoor fireplaces, and terraces. A walk on nearby Butterfly Beach will clear anyone’s mind. Katy Perry, Jeff Bridges, and Michael Douglas are some of the bold-faced named members of the adjacent Coral Casino Club with its ocean-facing Olympic-size pool, open to hotel guests. Hundreds of rose bushes scent the air at the Miramonte Indian Wells Resort & Spa with manicured grounds. The 11.5-acre Italian-styled resort is a favorite of Coachella rockers and the tennis pros who play the nearby BNP Paribas Open (March 6-19). The atmosphere is decidedly mellow; seating areas with fire pits encourage stargazing. Book a hot basalt-stone massage or date sugar scrub in the Moroccan-themed Well Spa to unwind and meld with the resort’s low-key vibe. Rooms are oversized and each has a private balcony or patio shaded by fragrant citrus trees. Hollywood loves a reboot and the Monarch Beach Resort, formerly the St. Regis, went through a $40 million overhaul in 2016 to enhance its assets. The grand lobby now opens directly to ocean and golf course views via balconies edged in glass. The main pool and infinity edge whirlpools are angled towards the ocean and fairways too. Glam poolside cabanas have everything needed for a day in the sun. The Miraval Life in Balance Spa (an outpost of the Tucson original) offers a full menu of relaxing and revitalizing treatments. Michael Mina’s Stonehill Tavern is the resort’s signature dining spot. Surf, spa, and bet on the horses come July at North San Diego County’s 121-room L’Auberge Del Mar. Interior designer Barclay Butera recently finished a makeover of the upmarket boutique hotel that sits above the Pacific Ocean; rooms now have a contemporary beach house look with corals and blues to complement the seaside location. Cabana rooms are popular for their large patios and pool and ocean views. Sporty pursuits include tennis or use of the resort’s beach cruisers. Come nightfall, drop into the hotel’s comfortable indoor/outdoor Living Room Bar for a nightcap. Stroll to Santa Fe’s historic plaza and the nearby Georgia O’Keeffe Museum from the Eldorado Hotel & Spa. The in-town resort reliably attracts A-list talent shooting in New Mexico. (“Magnificent Seven’s” cast called it home during production.) An underground VIP entrance ensures privacy. Mexican Colonial architectural details are found throughout the property and its art filled lobby; sunset views from the rooftop terrace and pool embrace all of Santa Fe. Restorative spa treatments at the Nidah Spa include a spun gold massage where flecks of gold dust are rubbed into skin — win or lose, channel Oscar. The design legacy of Mid-Century Modern architecture has found its place in the sun. The newly opened 201 bungalows at the Andaz Scottsdale offer open plan stays; each concrete and wood, colorfully decorated casita has a private backyard and front patio. Located in the shadow of Camelback Mountain, the 23-acre resort is centered around the hotel’s welcoming Guest House, a re-imagining of the traditional lobby, in its own glass-and-steel building. Diversions range from lounging at the convivial turquoise pool and bar to creating artworks with artists-in-residence from the close-by Cattle Track Arts Compound, the hotel’s artistic community partner. Ski in or ski out from the Ritz-Carlton Bachelor Gulch, located mid-mountain just above 8,000 feet on Colorado’s Beaver Creek Mountain. The Bachelor Gulch express chair lift is out the hotel’s back door and connects skiers and boarders to 1,800 acres of ski-able Rocky Mountain terrain. The Vail/Eagle airport is a 30-minute drive; Denver’s airport is just over two hours away. Although the log cabin-styled resort is one of the world’s largest freestanding log cabins it’s far from rustic: every luxury is here from an expansive spa with grotto to the plush club level lounge serving snacks and treats throughout the day. The outdoor pool and hot tubs are nestled in an Aspen grove. Summers here are equally scenic. Not all of South Florida’s action is on Miami Beach. Opened last summer 2016, East, Miami is 40 stories of hotel rooms and residences in the midst of the mega, mixed-use Brickell City Center, close to Biscayne Bay, downtown Miami and the happening Wynwood Arts District. Architecture is by Arquitectonica; the party-ready fourth floor event and pool deck is a see-and-be-seen spot. Rooms have extended views of the Bay or City and are sleekly furnished with every digital accessory built-in. Santa Monica’s Studio Collective designed the 40th floor outdoor lounge and restaurant Sugar: think leafy treehouse in the sky with craft cocktails. For those in a celebratory mood: press the ‘champagne’ button on an in-room phone at midtown’s Baccarat Hotel, for a choice of champagne accompanied by two Baccarat crystal flutes. Rooms are done in shades of white, accented with silver. Lighting comes from Baccarat crystal sconces; exquisite French crystal chandeliers are found throughout the hotel located in a 50-story tower directly across from the Museum of Modern Art. An intimate spa is adjacent to the indoor pool. Hotel guests can book exclusive packages, which give them access to varying VIP cultural events such as “Hamilton” tickets followed by a backstage visit with the cast. A weekly non-stop flight from LAX adds to the ease of reaching the tropical nation from the west coast. Ocho Rios’ 52-room Jamaica Inn has long been a go-to spot for Hollywood and the U.K.’s elite (from Marilyn Monroe to Kate Moss). The appeal is the resort’s private white sand beach and welcoming staff; all suites, cottages, and villas have a water view. The nearby reef is ideal for snorkeling but all manner of water sports can be booked. Secluded and romantic, the resort brims with colonial style and adheres to genteel ways.